While I’ve been holed up by the snow I’ve been looking at seed lists and catalogues. My first choice is always from the Cottage Garden Society seed swap, as I am a member and donator of seeds and as such get 20 packets for £4. There’s a huge choice and it’s a great opportunity to try things out. Vegetables first – what tomato shall I choose? Though Gardener’s Delight has always been a success, I might try ‘Alaskan Fancy’ or ‘Miel de Mexique’. Next I have chosen some annuals which fill gaps or extend the flowering season: cosmos, nigella and the climber ipomoea or morning glory, with some poppies,papaver rhoeas ‘Angel’s Choir’, if they have run out of those. The only drawback to the CGS list is the possibility you may not get what you are expecting. It may be the wrong plant – only very occasionally – or just slightly different from the plant the seed is from, especially with named varieties. The benefits outweigh these little glitches, and you may end up with another interesting plant to the one you envisaged! My other chosen seed source this year is the Organic Gardening Catalogue, to renew my stock of suitable garlic cloves. I think garlic is an ideal crop – expensive in the shops, so you do actually save money growing your own, and easy to grow. You just plant, hoe and harvest. I use my own crop to resow usually, but a damp harvest didn’t leave me with any good specimens. I’m also replenishing stocks of the OGC’s excellent mangetout ‘Weggiser’ and sweetcorn ‘Kelvedon Glory’. Other seed companies I like: Chiltern Seeds for their vast cornucopia of plants with tempting descriptions; Thompson and Morgan for lush photos of beautiful flowers, Touchwood Plants for the wide range of aquilegias and Franchi Sementi for a lovely range of Italian seeds, mostly vegetables. If you’ve ever wanted to grow radicchio, or any of the other amazing range of greens you find in an Italian market, now’s your chance! Enjoy your seed purchasing. Let me know of other favourite seed suppliers and I’ll include them in my links. 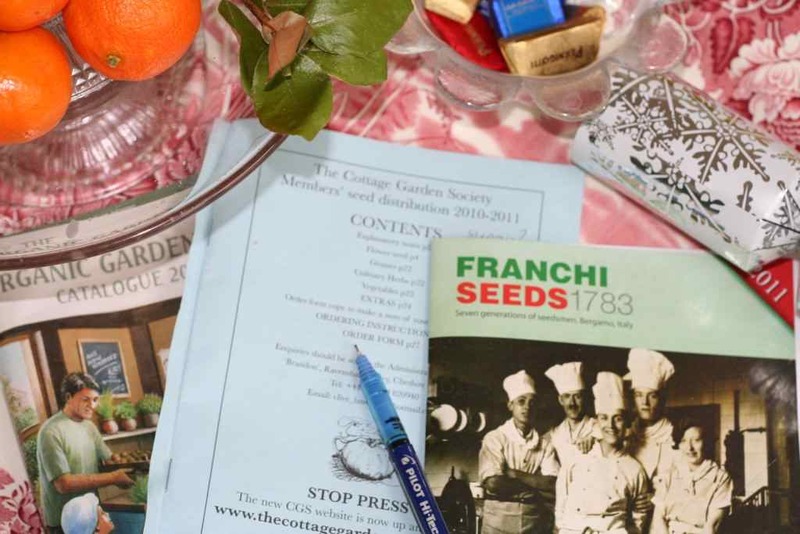 Thank you for sharing your seed supplers with us, I am very interested in the organic gardening catalogue, as although i have been growing my own vegetables for somes years now I have not had much success with the organic seeds I have used in the past. Hi – thanks for the comment. I will have a look at your site too. The OGC is the catalogue for ‘Garden Organic’, the charity for growing veg and fruit organically. Not all their seeds are organic but they indicate whether or not they are. I’ve found the seeds I’ve mentioned – the mangetout and the sweetcorn – very reliable, as well as their garlic, and mizuna, oriental saladini, pak choi and Paris Island lettuce (a small cos type lettuce). Welcome to the Blotanical Community Jane 🙂 I’m a fellow CGS member and have several plants in the garden that originated from the seed scheme. Dear Jane, I have just come across you in Blotanical and hope that you enjoy your time within this very varied and interesting community. Seeds are so addictive that I gave them up years ago. I really could not bear to see so many forlorn, unopened packages at the end of the gardening season knowing that I would be doing nothing about them except giving them away to gardening friends. I was, however, most encouraged to read your thoughts on Garlic. I have never grown a vegetable but shall try Garlic in a pot this year. I believe that it is terribly easy and you have given me further inspiration to ‘have a go’!! Hello Edith – I have just written you a short email on Blotanical (they restrict the length) to say thanks for ‘faving’ me. You are very right about seeds – I have just finished sorting mine. Because I donate I get 20 packets for £4 every year and it is very addictive! In fact, I am about to have a ‘seed swap’ coffee morning in my village to get rid of half of them. Unfortunately a lot of them are so old it may be too embarrassing to try to pass them on. Must prepare a nice piece of soil under the apple tree to chuck them in and see what comes up. .. Apparently people now have big events where they seed swap, with stalls of other kinds too. We shall see how it goes! Also, I happen to have planted my garlic this morning – very late – I usually get it done in November. It is easy – you have to let it bake a bit and also keep the weeds off it so it doesn’t get too wet and rot, however it does need watering if it gets too dry. Despite these things I usually have a reasonable crop. Good luck with yours! Would love to see pictures of your plot sometime. I enjoyed your post on seeds, but having a tiny city plot, rarely plant many. Thank your for visiting my blog and picking my post. I was so happy you did, now I have found you.